PITTSBURGH - Jan. 16, 2018 - PRLog -- . In highly polar aqueous solutions, proteins are sensitive to electrostatic interaction. Not only is the molecule charged by the water surroundings, but side chains of amino acids charge the protein. MD simulations to understand the folding and unfolding of proteins are based on classical force fields with electrostatic interaction  represented by fixed point charges. MD stands for molecular dynamics. However, point charges are modified during conformational changes, but attempts based on QM to explicitly modify charge during a MD simulation are impractical. QM stands for quantum mechanics. Even if QM modifications of charges could be made during MD simulations, the effect on folding and unfolding of proteins would not be significant compared to the more fundamental QM effect of the Planck law on the heat capacity of atoms. In this regard, proteins are generally thought to unfold upon increasing temperature based on the classical assumption the atoms have heat capacity. But the Planck law requires the heat capacity of the atom to vanish thereby requiring conservation of heat to proceed by a non-thermal mechanism. But QM requiring the non-thermal conservation of heat in a protein is controversial as tradition follows classical physics consistent with human experience where heat is known to increase temperature. In proteins, the QM conservation of heat by a non-thermal mechanism is proposed to be simple QED. As subsequently discussed, simple QED differs from the complex QED advanced by Feynman and others. 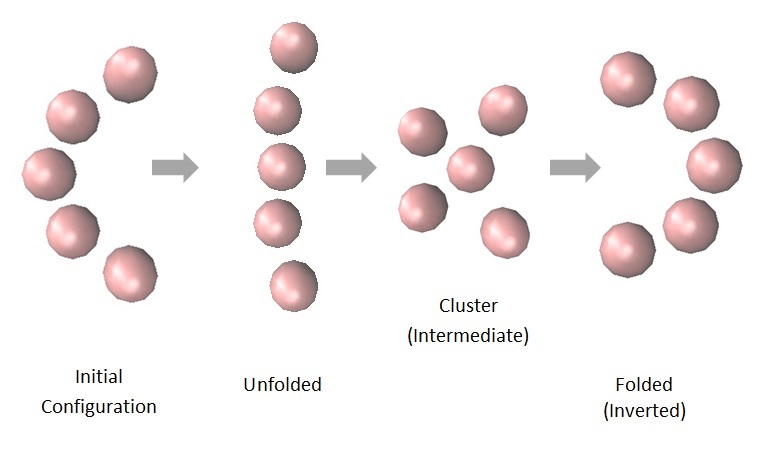 Simple QED requires the folded protein to be sufficiently compact allowing representation by a continuum of nanoscale dimensions, i.e., similar to a nanoparticle. Heat absorbed is therefore confined to the protein surface because of the high S/V ratio of the folded protein at the nanoscale. S/V stands for surface-to-volume. Since QM precludes any increase in temperature, the surface heat is conserved by simple QED creating EM radiation standing across the protein that by the photoelectric effect removes electrons to positively charge the constituent protein atoms. What this means is the heat traditionally thought to induce unfolding by increasing the temperature of proteins is actually conserved by producing charge that unfolds the protein by Coulomb repulsion. See diverse simple QED applications of the Planck law at the nanoscale, http://www.nanoqed.org/ , 2010 - 2018. Simple QED relies on the high S/V ratios of the protein whereby the heat is absorbed almost entirely in the folded surface placing constituent atoms under the high EM confinement necessary in the Planck law for heat capacity to vanish. A non-thermal EM standing photon having half-wavelength λ/2 = d is then created as the heat adjusts to the EM confinement bounded by the folded protein surface, where d is the diameter of the folded protein. The speed of light c corrected for the refractive index n of the protein gives the energy E of the EM radiation, E = h(c/n)/λ = hc/2nd, where h is Planck's constant. For folded proteins having d < 100 nm and n =1.5, simple QED creates a standing photon having λ < 300 nm and E > 4 eV. The EM radiation is therefore sufficient to remove electrons and induce positive charge in the folded state atoms, the Coulomb repulsion between atoms producing the unfolded protein. The MD simulation of QM induced charge in folding and unfolding of a simple 5-atom protein is illustrated in the thumbnail. Initially, the folded protein of semi-circular shape is found to relax to a cluster under attractive L-J forces. L-J stands for Lennard-Jones. Unfolding does not occur because the QM charges cannot overcome van der Waals attraction in the L-J potential. Unfolding only occurs upon applying sufficient QM induced repulsive positive charge ( 0.5 - 1 electron charges) between all atoms. Removing the QM induced charge allows folding back to a cluster with attractive L-J forces. The protein returns to the folded semi-circular shape ( shown inverted ) upon applying the QM induced charge. In the MD simulation, the QM induced charge is repeated by application to all atoms every few femto-seconds. Classical physics that allows the heated folded protein to increase in temperature is superseded by the Planck law of QM that requires the conservation of heat to proceed by creation of EM radiation. By the photoelectric effect, electrons are removed and the protein atoms acquire a positive charge inducing a state of Coulomb repulsion that unfolds the protein. Recombination of electrons with the charged protein atoms occurs on the order of < 1 ps. Over this time, the protein loses charge and assumes the extended unfolded state. Upon recombination, the van der Waals attraction in the L-J potential returns the unfolded protein to the folded state. Protein folding and unfolding are the consequence of fluctuating QM induced charge and neutralization over repetitive < 1 ps time scales.